Herbivores only eat plants. They do not eat any other animals. Howler Monkeys, Fruit Bats, and Blue and Yellow Macaw are some of the herbivores that live in the Amazon Rain Forest. This is where they are in the food chain: plants > herbivores > carnivores. Howlers live high up in the forest canopy. They eat fruits and nuts. They are eaten by jaguar other large mammals, large snakes, and humans. Found on the forest floor and also spend some time in ponds. Amazonian tapirs are considered browsing herbivores, feeding on herbaceous vegetation, fruits (they really like bananas) and even aquatic plants. Widely hunted by indigenous people in the forest. Pumas, jaguars and alligators also may prey on small tapirs. Leaf-cutter ants live in large colonies, sometimes reaching three million ants. They build gigantic hills for their home. Sometimes reaching thirty feet across and twenty feet deep. One of the most widespread insects in the Amazon Rainforest, these ants are one of the primary consumers of vegetation. 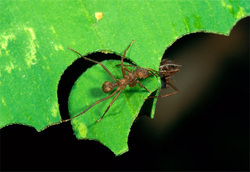 The ants do not actually eat the leaves, but on fungus. This fungus is grown when the ants bring the leaves they cut inside of their colonies. This is the only place where this certain type of fungus can be found. 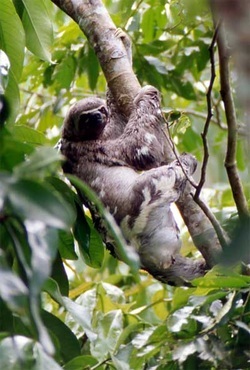 The slowest of all land animals—moving through the branches at one hundredth of a mile per hour! They like to hang upside down in cercropia trees and travel from the forest canopy to the forest floor. They are mainly eaten by eagles and jaguars. 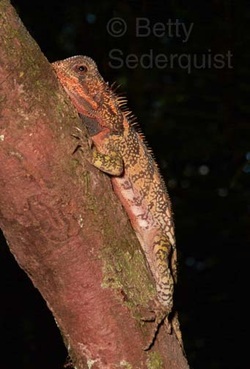 Iguanas live in the flooded forest regions of the Amazon rainforest. They rarely go to the forest floor and if threatened by a predator leaps into the water (sometimes onto the ground) for safety. They are mostly vegetarian, eating a broad diet of fruit, leaves, flowers and other plant matter. The Ornate Lorikeet lives in the tropical rainforest edge, high up in the forest canopy. They travel in flocks of 15 to 20 birds. Sometimes they will fly together, and there will be hundreds of birds flying in the air looking for food. They eat nectar and pollen mostly from eucalyptus and melaleuca trees, and fruits, especially apples, pears, berries, seeds, and small insects and grubs. I couldn't find any facts but I'm sure the Harpy Eagle would eat a lorikeet if it could catch one. Lives mostly in the forest canopy but also in the understory layer. Butterflies eat (drink or sip) nectar through a straw-like mouth part called a proboscis (pro-boss-kiss). Nectar is a sugar rich liquid produced by flowering plants. 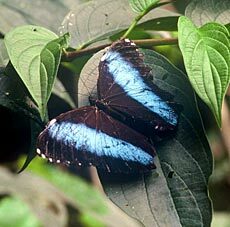 There are thousands of flowers that butterflies can obtain nectar from in the Amazon Rainforest. The male butterfly also needs a variety of minerals, which they acquire by sipping on ripe or rotting fruit, tree sap, piles of manure or mud. This typical butterfly behavior is called puddling. Frogs, lizards, and birds eat butterflies. 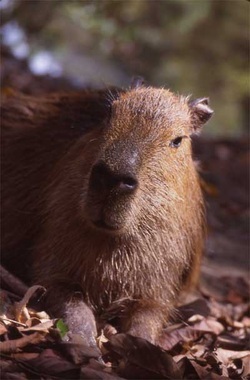 The world's largest rodent lives on the forest floor and spends a lot of time in the water. 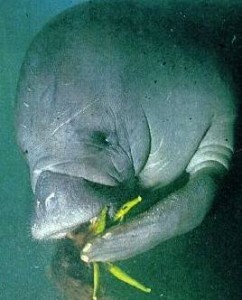 They eat leaves and fruits and also plants from the bottom of rivers and lakes. It is becoming rare around populated areas because it is hunted for meat. 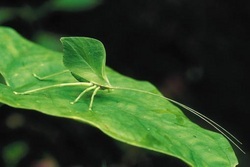 They eat avocado (young leaves), citrus, coffee, cotton, garden beans, macadamia and mango; ornamentals such as canna, anthurium, azalea, and hibiscus. They are eaten by birds, bats, spiders, frogs, snakes, and other insect-eaters. They live in the forest thickets. 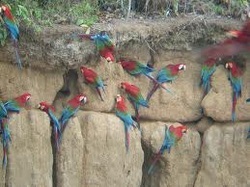 Macaws - largest of all parrots. There are many different kinds. Eats nuts, fruits, and seeds. They can be found in the forest canopy and emergent layers. They nest in holes in trees. 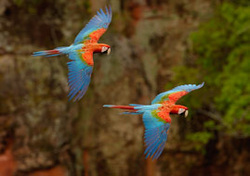 Macaws are on the endangered species list because of rainforest destruction and people capturing them for pets. 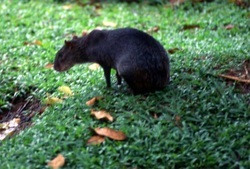 The Black Agouti is a smaller version of the capybara, but does not live in water. They roam the forest floor during the day, alone (sometimes in pairs), looking for fallen fruits and nuts. They disperse seeds of certain trees, like the brazil nut tree. The outer covering of these nuts is so hard that only the agouti can gnaw through it. 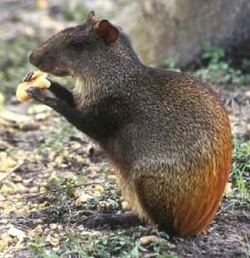 Squirrel-like, the agouti buries the nuts and forgets about some of them. These now have a chance to grow into trees. This rodent is hunted by man. 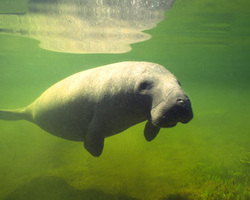 Lives in the Amazon River. Eats different types of aquatic plants. It's closest relative is the elephant. Human development is their greatest threat.